Every teacher needs a classroom seating chart to maintain a structured learning environment. Rather than drawing it by hand, or wasting your own time creating a document, do yourself a favor and take advantage of another one of GradeA's helpful free downloads. the school year or semester. This document can also serve as an excellent tool for substitute teachers, who are often victim to students switching seats so they can sit next to their talking buddy. 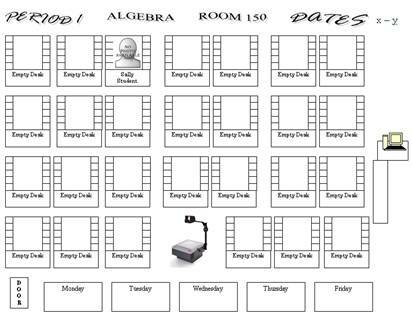 With a seating chart complete with pictures, you will be able to keep control of your classroom even when you aren't there. assignment was for future reference. Save yourself the time and headaches and get in the habit of using a weekly seating chart--you will never forget to do those daily administrative tasks again! Click the image above to download a free customizable classroom seating chart - you'll be happy you did! You may also want to explore the rest of GradeA's free (math) teaching tools.